RSS Feed for keyword: "Bear Pictures"
Brown bears, black bears, grizzly bears and polar bears all make their home in North America. These pictures capture bears in the wild - eating, sleeping, and at play. Black bears are at home in all of Canada and much of the United States. Their fur is usually black, but can grow brown, blond, and even white. Black bears live in the forest and usually shy away from people. They are omnivores, eating fruit, nuts, greens, insects, and meat, and they can climb trees. 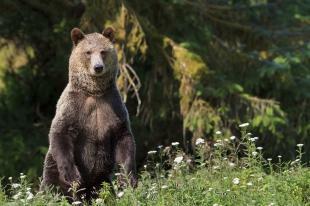 Interesting Photo galleries related to "Bear Pictures"
...Continue gallery information: They are solitary animals, and like the black bear can come in many different shades of brown. 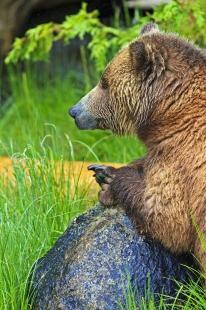 Most of these photos are taken in Alaska, where grizzly bears number about 40,000. Polar bears are perhaps the most mysterious of all North American Bears. They are certainly the most rare. Few people venture as far North as the bears, and fewer still can claim they've seen a polar bear in the wild. Some Arctic natives call these massive animals "water bears," as polar bears are powerful swimmers and hunt mainly marine animals such as seals, fish, and walruses. Many of these polar bear pictures are taken near Churchill, Manitoba. Bears won't usually attack a person unless provoked, so when in bear country, treat these animals with respect. All bears are fiercely protective of their babies, so be sure to hang back when young cubs are out and about. Bears are one of Rolf's favorite wildlife species to photograph. Here you see Bear Pictures, all captured in North America. Some special places to photograph bears are in Churchill, Manitoba where the Polar Bears are more easily accessed while Grizzly Bears and Brown Bears are mostly photographed in Alaska. 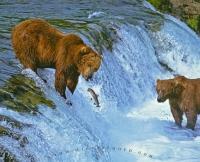 Some of the Alaska bear images are taken in Denali National Park and Katmai National Park as well as in the Brooks Range. The Black Bear Pictures are taken in several Travel Locations such as Northern Vancouver Island in British Columbia, the Yukon Territory, and Southeast Alaska.Enjoy the images, we will upload new photos in the future.